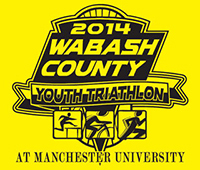 NORTH MANCHESTER – Children in grades 1 – 6 are invited to take part in the free 2014 Wabash County Youth Triathlon at Manchester University on Sept. 27. Age-appropriate events will take children on a bicycle course around the campus, onto the University running track and through an obstacle course. An inflatable bounce house and a healthy snack will be provided. “This started as an idea to get kids more active,” said Ryan Hedstrom, an associate professor of Exercise and Sport Sciences at Manchester. Although the focus is on childhood fitness and obesity in Wabash County, the event is open to all. Each participant will receive a medal and a T-shirt, and parents are asked to be present at all times for supervision and educational purposes. Manchester University students will help run the event and assist children. Participants are asked to arrive by 9 a.m. on Saturday, Sept. 27, and bring a bicycle. The event is hosted by the Department of Exercise and Sport Sciences and funded by a grant from the Community Foundation of Wabash County.